To open an email, click on the line containing it in your inbox. Apart from the standard email handling operations (reply, forward, delete, mark as spam etc. ), you can translate an email, view its properties or create a filter for that type of email. I'm getting someone else's email that was sent to my.address@yandex.ru at my my-address@yandex.ru mailbox. To view previous emails within a discussion, click on the Show conversation link. Click View trimmed message to expand the previous message completely. To view all messages in this thread, click the link below Show all messages. You can reply to the sender or to all participants of the correspondence from the message reading page. If you want to reply to some participants of the correspondence only, click the quick reply form, select Open the full reply form and remove the recipients you don't want to send the message to. To forward a message, click Forward at the bottom of the page. Disable the show sender's profile picture option. If the email contains an attachment, then it will display as a thumbnail or icon in the email list. To hide attachment thumbnails, open Settings → Other and disable the show attachments in message list option. Note. If several files are attached to the email, then the files will be downloaded as a ZIP archive. To view a certain document or archive, select it and then click View. The file will open in a new window. The attached images are displayed as thumbnails. To open an image in the view mode, simply left-click its thumbnail. To exit view mode, click in the upper right corner, or hit Esc. Check that you entered your email address correctly on the website that you expect to get emails from. Find out if the sender wrote your email address correctly. Look for the email in your Spam folder; it may have ended up there. If this was the case, highlight this email and click Not spam! ; the email will migrate to your Inbox. Make sure that your message filters don't contain a filter that deletes these emails or sends them to your Spam or another folder. If there is such a filter, disable it. Check that the site's or sender's email address isn't blacklisted. If you are sure that the mailbox and address settings on the site were entered correctly, try asking the site or sender to send you the email again. If the message does not arrive within a few hours, please contact site administration. Message delivery problems may also occur due to technical problems on the mail servers on either the sender's or recipient's side, heavy traffic in communication channels, etc. In this case, the sender will receive an automatic report stating the reason for nondelivery. If the sender didn't receive a report, then they need to contact the tech support department of the mail service that the email was sent from in order to determine the reason for non-delivery. If you didn't receive your emails from a different mailbox (i.e. your mail importer isn't working), then follow the recommendations on the The email importer worked earlier, but isn't now page. If your address includes a hyphen but you are getting emails with the address entered using a period (or vice versa), then these are your emails (not someone else's). 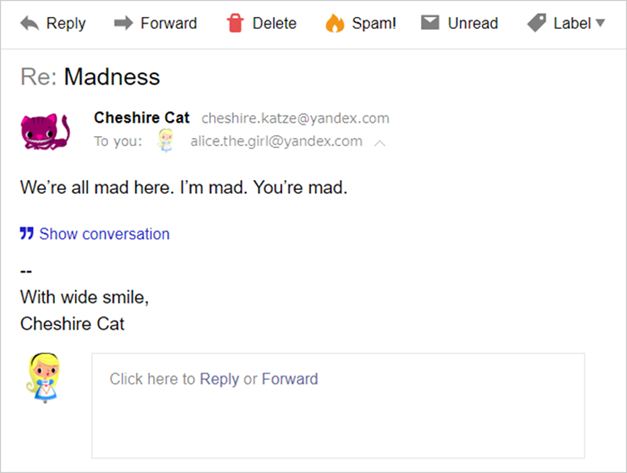 Yandex.Mail considers addresses written with a hyphen to be equivalent to those written using a period. These are aliases (synonym addresses for the same mailbox). They always belong to the same recipient. In other words, if you registered the address my-address@yandex.ru, you can send and receive emails at my.address@yandex.ru. Nobody else can use either of these addresses. Add the address of the person sending these emails to the Blacklist. Contact the website administrator and inform them that your address was used on their site by mistake. If you received an email that was sent not to your address but to the address of somebody else, most probably it is spam. The email can be addressed to you, even if you do not see your address in the field To. Your address can be indicated, for example, in the field Bcc. If someone sends you an email and it is not delivered, the sender will receive a non-delivery report from the “Mailer-Daemon” service. Delays may occur on either the sender's servers or on Yandex's servers. Open the properties of the email that was delayed. The properties contain several Received fields. Find the one at the very bottom next to the Subject and From fields. The server address and time when the email reached the server are indicated in the Received field. If you look up through the chain in the Received fields and compare times, you can find out the address of the server where the email was delayed. If an address of the type example.mail.domain.net has yandex before the last period (i.e. in the place of domain), it means that the email was delayed on Yandex's server. If a different value is there, it means the delay occurred on another mail service's server. Reload the page by pressing the keyboard shortcut Ctrl+F5. Then clear the browser cache and delete all cookies before trying to open the email again. Yandex.Mail may not work properly due to certain browser extensions or add-ons. You can temporarily disable them to determine if this is the case. 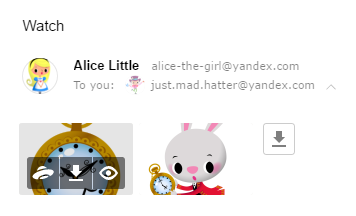 If ad blockers or antivirus extensions are causing problems with Yandex.Mail, then you can add the Mail page to the list of exceptions for that particular extension. Users of any mail service may come across dangerous situations since not all servers that handle mail delivery meet sender identification requirements. If you receive this type of email, select it and click Spam so that Yandex can improve its spam filtration.